Congratulations to Ryan Howard, who accomplished something really rare Thursday night. He didn’t strike out. Honest! For me, the applause for reaching 200 home runs faster — in terms of games played — than anyone in history is muted by the noise-pollution of his strikeouts. I’m not a big fan of the modern all-or-nothing style. It’s not baseball; it’s over-the-line, a game we used to play on the beach, in flip-flops. Howard smacked his 200th on Thursday in his 658th game, 48 fewer than Ralph Kiner, the previous record-holder, had taken to get there. But what about the toll of the power journey? Howard has been rung up 795 times. At the time he hit his 200th, Kiner had fanned about 450 times. And he was ashamed about the strikeouts, most of which came earlier in his career. Then he learned the strike zone. By 1949, the season before he reached No. 200, Kiner hit 54 home runs — and struck out 61 times. That’s a slow month for Howard, with his 795 strikeouts, already more than Kiner had in his entire career. Kiner was punched out a total of 749 times. FEBRUARY 1 will be a big day in Phoenix. The Super Bowl? Nah. Baseball’s arbitration hearings will kick off that day and, though small in number relative to the long list of players eligible for arbitration, the process profoundly impacts the game. Ever wonder why it’s called a “hearing”? I think it’s because the player sitting in that room can’t believe what he’s hearing. His game is ripped apart by club reps out to convince the three arbitrators that he only deserves the team offer, not his request. It’s not a place for the thin-skinned and insecure. After a few hours on that rack, most players can’t wait to flee to another place where they can feel more appreciated. Nothing like free agency to turn on the love, as suitors talk their ears off. Of the 14 players who have had to go through a hearing the last four years and eventually reached free agency, 13 abandoned the team that had to testify against him — win or lose.The ony exception, Oliver Perez, seems to be fighting against re-signing with the Mets, over whom he actually scored a hearing decision a year ago. Clubs do realize the stakes, a lesson that took a while to learn. Nowadays, hearings run about 5-7 a year. Through the first two decades of a process that began in 1974, there were typically dozens of hearings every year, peaking with 35 in 1986. 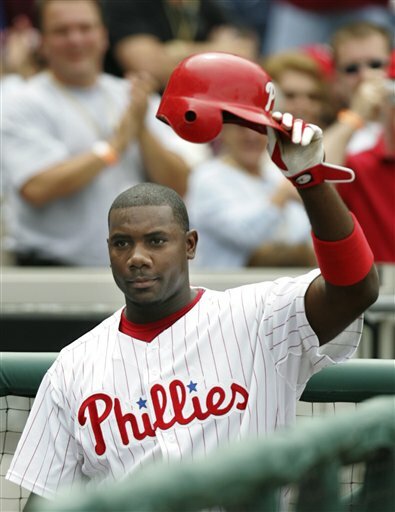 RYAN HOWARD is the Donald Trump of the current arbitration group, with his $18 million request. For the reasons cited above, I expect the Phillies to be very eager to avoid another hearing with him. For one thing, the club’s $14 million offer sets up a perfect midpoint for a compromise agreement. For another, the Phils learned in losing their 2008 hearing to Howard that their one argument — his record strikeout numbers — has no weight in this era. Not with nine of the top 14 all-time single-season strikeout totals having come since 2000. JEFF KENT: I’ll miss seeing him, both on the field and in the clubhouse. He was a genuine throwback. He’ll now have the time to perfect those wheelies on his motorcycle. JAY MCGWIRE: Gee, I guess we now get why he’s estranged from brother Mark.